As a way to both look back at a great minor league season and celebrate the release of the 2019 Twins Prospect Handbook, I’m shining the spotlight on a few players in the system. Let’s talk about the guys who could help out the 2019 bullpen. 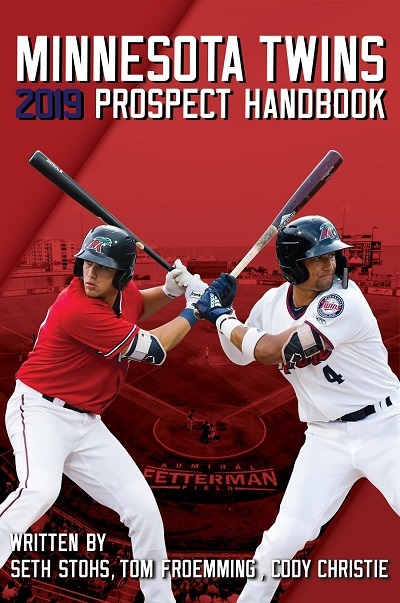 The 2019 Minnesota Twins Prospect Handbook is available in paperback for $17.99 or as an eBook for $12.99. Each of the previous installments of this series focuses on a specific aspect of a player's game or homes in on a particular performance. This will be more of an overview. We’re in the era of the 13-man pitching staff. Every team in baseball cycles through a great number of relievers each season, but there figure to be plenty of opportunities in the Twins’ bullpen this coming season. The only relief pitcher who still has prospect status is Andrew Vasquez, but there are also all those starting pitchers who debuted last season who appear to be on the outside looking in. Might it make sense to give one of Chase De Jong, Stephen Gonsalves, Zack Littell, Kohl Stewart or Lewis Thorpe a shot in the bullpen? None of those guys have pitched much in relief, and some don’t fit a typical reliever profile, but it wasn’t long ago you could have said those same things about Taylor Rogers. There’s already been some talk of Fernando Romero (who is no longer technically a prospect) getting a look in the pen, maybe the Twins will consider a conversion for one of these prospects. Romero may have the most tantalizing arsenal of that group, but it's interesting to note that both Littell and Gonsalves had better strikeout rates in Triple A last season. Romero averaged 6.8 K/9 in 90 2/3 innings with Rochester while Gonsalves was at 8.5 K/9 in 100 1/3 innings and Littell had 8.3 K/9 in 106 innings. Back to Vasquez, in terms of true relievers, he ranks third on the lefty depth chart behind Rogers and Gabriel Moya. There's a great chance he'll see time in the majors again if that remains the case. The Vasquatch has dominated the minor leagues, pitching to a 1.52 ERA, 1.12 WHIP and 13.4 K/9. Who’s Next on the Farm? Before we get to the prospects, there are a few minor league veteran guys who have an outside chance at working their way up into a low-leverage role. Guys like Ryne Harper, Dario Alvarez, Mike Morin, Zack Weiss and Jeffery Ames. I’m sure the Twins will add a few other relievers on minor league deals. Some of those guys won’t even last through spring training, but others will get an opportunity to show what they’ve got in Rochester. This front office seems to be intrigued by fringy relief pitchers, though they’ve mostly acquired them through waivers (Matt Magill, Oliver Drake, David Hale, Dillon Gee, Nik Turley and Drew Rucinski among others). I assume they’ll continue to be active on that front as well. The guys this front office do not seem to like are all the relief pitchers drafted in the earlier rounds under Terry Ryan. Jake Reed is pretty much the last man standing among that group. He’s 26-years-old and has 61 Triple-A appearances under his belt, so what are they waiting for? Well, behind Reed’s sterling 1.92 ERA in the 89 innings he’s pitched for the Red Wings the past two seasons is a less impressive 8.4 K/9 and 3.4 BB/9. Still, production is production, and Reed should be the first man up if the front office is in the position where they need to add a relief arm to the 40-man roster. It’d be a shame if he doesn’t get a look at some point. Another name of note in Triple A is Ryan Eades. Drafted in the second round as a starter back in 2013, Eades has primarily worked out of the bullpen the past two seasons. After posting just a 6.9 K/9 in 2017, he hiked that all the way up to 10.4 K/9 last season. The really great part was that he also lowered his walk rate from 3.4 BB/9 to 2.6 BB/9 last year. Eades was outstanding in the six starts he made, posting a 0.45 ERA and 0.90 WHIP, but the longest he went was four innings. Could he be the perfect opener? Eades is 27-years-old, so there’s really no use in leaving him in the minors should an opportunity present itself. Behind Reed and Eades is another bunch of guys who’ve only reached Double A. Tyler Jay is certainly the highest-profile name among them. For me, the question is does the velocity come back? If it does, I could see Jay move up very quickly. If not, well, he didn’t exactly inspire confidence by posting a 4.22 ERA and 1.58 WHIP last season. So let’s forget about Jay for a minute. The name I really want you to come away from this article with is Cody Stashak. The Twins converted him to the bullpen last season and it was a roaring success. The 24-year-old right-hander was one of the best pitchers in all of Double A.
It’s not like Stashak was a failed starter by any means. In 2017, Stashak had a 3.89 ERA, 1.10 WHIP over 16 starts. His strikeout rate was a fairly modest 7.8 K/9, but he was certainly getting the job done. 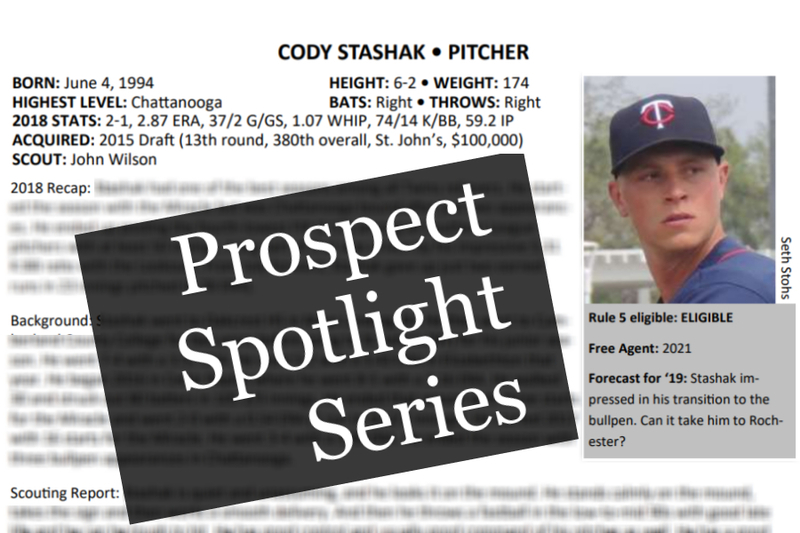 Stashak was forced to the DL in late July, had a few rehab appearances out of the bullpen with the GCL Twins, then made his final three outings of the year in relief for Chattanooga. I’m not sure the reasoning behind why they decided to keep him in the bullpen, but it’s looking like a very wise decision. In 2018, Stashak had a 2.87 ERA, 1.07 WHIP and 11.2 K/9. He also continued to have very good control, posting a 2.3 BB/9, giving him a K:BB ratio of 4.93. There were 289 players who pitched 50 innings or more in Double A last season. Stashak ranked fifth in K-BB%, eighth in FIP, 12th in strikeout rate and 16th in swinging strike rate. It was basically your dream scenario when you move a guy to the pen. Here’s a quick look back at one of Stashak appearances from last year just to give you an idea of who he is. This is every single pitch of this particular outing, so there’s no sugar coating involved. I’d hoped to pull some more video on him, but MiLB.tv was malfunctioning, so this also wasn’t a cherry-picked outing. It just happened to be the one I was able to get. Stashak also ended the year particularly strong, allowing just two earned runs over his final 23 innings (0.78 ERA). If he carries that performance over to this season, he may be knocking at the door for his major league debut. This front office has made some eyebrow-raising decisions with relief prospects, but most of the guys they’ve passed over had some degree of wildness. That hasn’t been an issue for Stashak. Speaking of guys who moved from the rotation to the bullpen, there’s also Devin Smeltzer, a lefty who the Twins acquired from the Dodgers in the Brian Dozier trade. He didn’t have the same type of dynamite transition as Stashak, but his strikeout rate did see an incredible jump. After striking out just 53 batters in 70 1/3 innings as a starter (6.8 K/9), Smeltzer rung up 30 batters in just 25 1/3 innings out of the bullpen (10.7 K/9) in 2018. One guy who could be a huge x-factor is Jorge Alcala. The flame-throwing right-hander who the Twins got from Houston in the Ryan Pressly trade could really rocket up to the majors if he successfully transitioned to a relief role, not that I’ve heard that’s the plan for him. Alcala made 16 starts and another eight appearances in relief in 2018, performing about the same in either role. He struck out 104 batters in 99 1/3 innings last season. Anybody who hasn’t pitched in Double A is a longshot to make it all the way up to the majors in one year, but hey, Andrew Vasquez did it. Quite a few members of last year’s Miracle bullpen were college draftees who will now be entering their age 24 or even 25 seasons. Guys like Hector Lujan, Ryan Mason, Alex Robinson, Colton Davis, Adam Bray and Tom Hackimer. If one of them really takes off, there doesn’t seem to be much reason not to fast track them, though a Vasquez-type ascent would be surprising. More than 160 players are featured in the Prospect Handbook.We had a ton of fun putting the book together and we’re really excited for people to read it. Recognizing these minor league players for their efforts and ability is a big motivating factor in the project, so we would love for you to pick up a copy. Nice article, I'll keep my eyes peeled for Stashak. I think Alcala could see similar leaps and bounds if/when he's transitioned to the bullpen, as I don't think he should be a starter. I'm intrigued to see more of De Jong, as I thought of the young pitchers (Gonsalves/Littell/Stewart) he did the best. I'd rather see him start games than Martin Perez... but maybe he could end up filling the Anthony Swarzak role of being the long reliever/opener. Here's hoping the bullpen prospects can finally find some success in the majors! You nailed it on Stashak and Eades, Tom.. Those are two of my picks to make their "surprise" major league debut with the Twins this season. Stashak and Alcala are the two that excite me the most, but don’t sleep on Jovani Moran’s dominant 2018. Honestly, I think Moran has the potential to reach the show faster than Vasquez did. Well, by the time the Twins get done "developing" guys like Stashak and Alcala they will be about 34 years old. Stashak will turn 25 by mid-season and has only reached AA.Since he started last season at FTM, the Twins will almost certainly keep him in AA for the entire season. Sean Poppen, Randy LeBlanc, Tyler Jay, Tyler Wells are in the same boat. Because this team has not "processed" through the current wave of Romero, Gonsalves, Moya, Mejia, Stewart, Thorpe, these guys really have nowhere to go. Tyler Wells is a guy that has a career minor league ERA of 2.82 with 288 strikeouts in 255 innings.A college draft pick in 2016, he is already 24 years old. Randy LeBlanc is a 2014 college draft pick and he will turn 27 in March. He has a 2.92 career minor league ERA and his highest level in the Twins organization is AA.Stashak's career minor league ERA is 3.14. I guess I see this as a huge problem for the Twins.Having too much talent isn't a problem,but if you are not going to maximize the value of your farm system it is a problem. Although I see a few Miracle games a year, you see some pitchers and not others.I have never seen Wells pitch so I cannot comment on his stuff. But, statistically I cannot see how any rebuilding organization with a lack of arms would not have him on the cusp of a major league debut, but with the Twins he is probably several years away. And, as always I will repeat my refrain.If I were an agent for a college draft pick, I would request the Twins not to draft my players and if they did, I would advise them not to sign.The Twins move their older draft picks, and all of their draft picks for that matter, too slowly through the minors and do not do enough development of their players in the system.Each year you spend repeating levels of the minors you were successful at the year before is an injury risk you take before you ever get a chance of a major league contract;each year they deliberately leave you behind is another year you have to wait to get to free agency.They would rather bring in players like Matt Belisle and this year Martin Perez than give their own drafted players a shot at a major league spot.The facts do not lie on this matter. Very interesting and informative article! I'm intrigued by some of these minor league pitchers such as Stashak, Smeltzer, and Alcala. As much as I'd like to see another veteran arm in the bullpen (one with some upside as opposed to another Belisle type signing), I'd also urge the front office to promote some of these prospects who are putting up good numbers in the minors. Time to see what they got. I'd say he has a lot of guys to leapfrog, but then again, I'd have said the same thing about Vasquez last season. The big difference is Moran is much younger (21), but who knows how much a difference that makes? Again, I'm having a hard time trying to figure out how this front office decides to handle relief guys. But to your point, Moran is most definitely a guy to keep tabs on. I actually have him in my top 30. We've talked a lot about guys going from the rotation to the bullpen, but I'd actually be interested to see how Moran could do as a starter. I think he's got three legit pitches to work with. It might be a little late in the game to try that, though he did throw 76 innings last year and got nine or more outs in seven of his appearances, so it may be a little easier to stretch him out than the average reliever. I don’t get the hype for Alcala. He throws hard and that’s about it. His delivery is very visible to hitters and his not great numbers show it. Tyler Wells is a much better overall pitcher. May not have the 99 mph but I’ll take pitching over just heat. His numbers outside of a 20 inning sample size at Chattanooga were pretty good. Alcala does show aptitude for making adjustments, so there is belief he can remain a starter. His control and command also need refinement, but he's making progress in both areas. If he does wind up in the bullpen, he has closer potential and could regularly hit 100 mph in shorter stints. I'm on board with Stashak (he was my adopt-a-prospect last year) and thought he had a chance to get taken in the Rule V draft. I'd also like to see most of the guys hoping for the 5th starter spot start getting bullpen work, either with the big club or in Rochester. They all can't stay starters if they have hopes of playing for the Twins, I'd rather find out who's stuff best translates to the pen now before it's too late and the team is pressed into uncomfortable 40-man decisions. I really dislike when the team is forced to DFA one of these back-end starter types before they gave them a real look in the pen. It should be a full season too, not just a month here or there, those guys seem to need a year for the transition to show results. And the role change is not required to be permanent. In the minor league levels, I'll take the heat. A pitcher's delivery can be changed, the velocity really can't. Twins are going to need starters in 2020, that requires some of their prospects to stay starters.Someof the higher velocity low stamina pitchers need to be converted to relievers and moved very fast this year. some of the prior relievers, may still have a chance, this year will be defining for them. Not really true. Many guys have increased velocity. I expect Wells to for sure. Dude looks like he’s not even trying and it’s 90-94. Totally agree on Eades and Stashak.In my prospect list last offseason regarding Stashak, among other things I wrote: His small sample size success at the Chattanooga pen at the end of last season, makes one wonder whether he can shine in the pen if his fastball gets a couple of ticks.It looks like this is what happened.His FB looks like mid-90s from 88-92 as a starter.He had mainly two above average pitches (FB & CU) so the transition made sense.Curve looks close to plus, but need to look in person. Alcala is an interesting story.He is pretty early in his development besides being 23.He was signed as an International Free Agent at 20 years old, instead of the customary 16 and 17.So his body is that of a 23 year old, but his baseball acumen is that of a 19 year old. I think that he will be a later riser and that he is another year or 2 away because of his later start.For this reason, I suspect that the Twins will make everything possible to keep him developing as a starter. Another worthwhile name to keep in mind for this list is Rande LeBlanc.Had some arm issues, but if healthy I can see him making the transition to the pen more than I see him as a starter. The second group of ten pitchers is in Fort Myers for individual instruction. They will be joined next Monday by Brusdar Graterol, Jordan Balazovic, Jhoan Duran, Blayne Enlow, Prelander Berroa, Luis Rijo, Josh Winder and Jorge Alcala, according to Dan Hayes. I wonder how many of the pitchers Tom has mentioned are in camp now, and how the new instructional program is going. Did you know in early 2017, we were the second youngest team in all of baseball, based on weighted playing time? The facts show your post isn't very accurate. That wasn't even 2 years ago. At some point in time pitching becomes a numbers game. We have decent major league ready starting pitching in Rochester, no where else do we have numbers on our side either starting or in the pen. I expect us to continue to be very active at the trade deadline and 1 year contracts are an excellent tool. We do have members badmouthing 1 year contracts, but they are far from convincing. I agree on Stashak. If his performance is repeatable, he could see Minnesota next year. I held my breath all the way thru the Rule 5 draft because I could see a non-contender putting him in their bullpen. There does deem to be a lot of pitching coming thru the system, but the more bullpen arms the farm can develop, the fewer expensive bullpen arms that will need to be signed. I really think the farm should be able to develop all the arms a team needs if a continual flow of new arms is added. And if there gets to be an abundance at the top level, they become currency for the front office to use to shore up other areas.